Orvieto is one of the most dramatically-situate hill towns in Italy, perched on a plateau atop huge tufa cliffs. Orvieto has a beautiful duomo (cathedral) and its monuments and museums cover millenniums of history starting with the Etruscans. Many travelers visit Orvieto as a day trip from Rome, but this enchanting hill town offers plenty of diversion for a few days or more. It's a great stopping-off point between Rome and Florence, and highly recommended for its restaurants offering traditional Umbrian cuisine and local wines, shops selling made-in-Orvieto artisan goods, and its authentic, charming ambiance. The Medieval Duomo, or cathedral, is one of the most impressive examples of medieval architecture in Italy. Building started in 1290 but it took almost four centuries to finish it. The cathedral's stunning facade is embellished with mosaics that glimmer in the sunlight. The Gothic style interior holds frescoes by Fra Angelico and Signorelli and beautiful wooden choir stalls. Underground caves and passageways dug into the tufa beneath the city have been in use since Etruscan times. During the Middle Ages, the network of passages grew larger and was used for water cisterns, cold storage and pigeon breeding. Daily tours of the Orvieto Underground can be booked at the tourist office across from the Duomo. Self-guided tours of the private Pozzo della Cava are also recommended. Torre del Moro, 47 meters tall, is the highest point in the city. From the top of the tower, there are incredible views over the Umbrian valley and hills. Saint Patrick's Well, built in the early 16th century, is an architectural marvel. Its double spiral staircases run along the sides of the well, 62 meters deep, without meeting. Each has 248 steps and is just wide enough for pack animals to descend and then carry water back up. Etruscan sites are mainly outside the historic center and include remnants of the Etruscan wall around the town, tombs and a necropolis. Two excellent archaeological museums on Piazza del Duomo hold fascinating artifacts from excavations within and nearby the city. Albornoz Fortress is a Spanish castle at one end of the upper town where an Etruscan temple once stood. The original fortress was torn down and this one dates from the mid-fifteenth century. Lovely Via del Duomo is lined with shops selling local Orvieto-style ceramics, as well as wine, olive oil, meats and cheeses from the vicinity. A stroll down Corso Cavour, Orvieto's main drag, reveals casual trattorias and wine bars, clothing and accessory stores, and a colorful slice of Italian life. Orvieto is in the southwest of central Italy's Umbria region. It's about 60 miles north of Rome, just off the A1 toll road between Rome and Florence. Orvieto can be visited as a Rome day trip or on a guided day trip from Rome that includes transportation and a visit to Assisi. Orvieto has several quality hotels, B&Bs and vacation rentals in all different price ranges. Recommended options include Hotel Virgilio, Hotel Palazzo Piccolomini. For regional cuisine, head to Trattoria del Moro, La Palomba or Grotte del Funaro, located underground in a former rope-maker's workshop. Orvieto, on the Florence - Rome line, is easily reached by train. Its train station is in the lower town, connected to the upper town by a funicular. There are large covered parking areas on Via Roma and at Campo della Fiera just outside the upper town. Elevators and escalators help transport visitors to the historic center, which is closed to non-resident traffic. A mini-bus runs through the town and stops at the major tourist sights. The tourist information office is on Piazza del Duomo, the large square in front of the cathedral. They sell the Carta Unica that includes major sites and museums as well as the bus and funicular. Orvieto is a main center ​for majolica pottery and many shops in town sell the pottery. Other handicrafts are lace making, wrought iron work, and wood crafts. Wine, especially white, is made in the vineyards of the hills and you can taste or buy it in town. 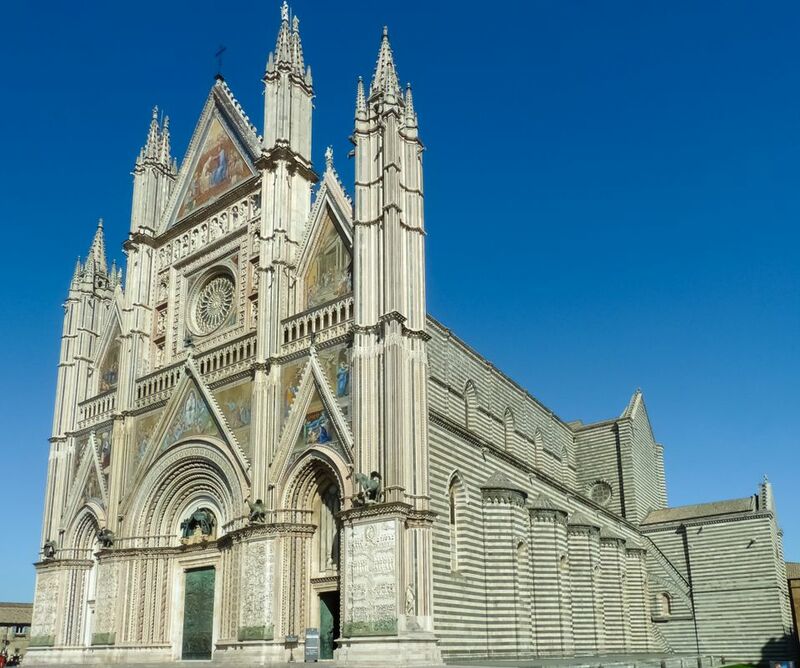 Orvieto makes a good base for exploring southern Umbria (see Best Umbria Hill Towns) and the neighboring region of Northern Lazio with Etruscan sites, gardens, and interesting small towns. Rome can even be visited as a day trip from Orvieto, just over an hour by train.